Some of the more inexpensive cuts of beef, such as the chuck or rump, can produce tasty and tender roasts if cooked properly. While both the chuck, known also as a chuck shoulder or chuck pot roast, and the rump, often called a bottom round roast, have many similarities, there are a few key differences that set the two worlds apart in the kitchen. Before dividing the meat into steaks and roasts, there are eight initial cuts, known as primal cuts, made to a cow. The chuck comes from the shoulder portion of the cow, while the rump, also known as the round, comes from the cow's hindquarters. Since both cuts are from heavily exercised parts of the cow, they contain copious amounts of collagen and connective tissue that make the meat very tough. Of the two roasts, however, the rump roast is slightly more tender than the chuck. All beef is a good source of protein, zinc, vitamins B-6 and B-12, niacin, iron and riboflavin, but there are some differences between chuck and rump roasts when it comes to fat and calories. Chuck roast is one of 29 cuts of beef designated as lean by the U.S. Department of Agriculture, with one 3 oz. serving containing 147 calories, 5.7 g of total fat and 1.8 g of saturated fat. 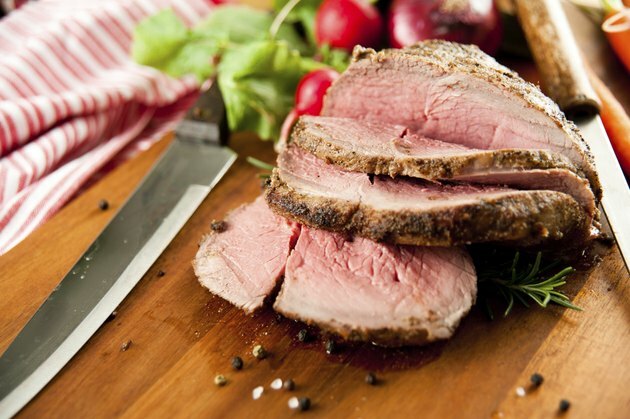 Rump roast, also known as bottom round, is one of only five cuts of beef that earned the designation of extra-lean, containing a mere 139 calories, 4.9 g of total fat and 1.7 g of saturated fat. Both chuck and rump roasts lend well to braising, either on the stovetop in a Dutch oven or electric slow cooker. You can also oven-roast a rump roast as long as you cook it low and slow and cut the resulting roast into very thin slices. Whether using a dry- or wet-heat cooking technique, the key to making these tough roasts palatable is a prolonged cooking time over relatively low heat, which allows the connective tissues that make them tough to dissolve. When braising a chuck or rump roast, the beef comes out well-done. When oven-roasting a rump roast, however, you should always cook it to the minimum internal temperature recommended by the USDA of 145 degrees F to ensure that it remains as tender as possible. In a comparison of various cuts of beef, Amazin' Grazin' Beef gave both the rump and the chuck two stars out of five for flavor. Despite receiving the same rating, the chuck roast's taste is a bit more mild than the rump roast and the texture is grainier.